Connected Smart Litter Weighs Your Cat's Poo, Keeps Track Of Its Health | OhGizmo! Cats are sleeping and pooping machines by design. And despite their limited use, we love them and want to make sure they stay healthy. 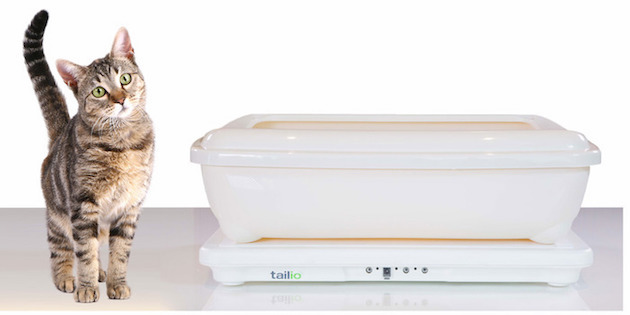 To that end, a San Diego company called Pet Wireless has created the Tailio, a connected smart litter. After connecting to your home’s Wifi, the built-in scale starts keeping track not only of your cat’s weight as it does its business, but of the weight of its poo and pee as well. A healthy feline stays more or less at a constant weight, and so do its excrements; any unusual fluctuations could indicate a health issue. Tailio will send all the data to the cloud where it’ll be analyzed and communicated to you. Aside from looking for possible health concerns, you can use Tailio to keep track of your cat’s growth, or to assess the effectiveness of a weight loss program. And if you fancy yourself a cat lover and a data nerd, a $99 pledge will get you your very own Tailio.